This product comes in form of convenient capsules that facilitate the bioactive compounds delivery. The capsules are made from vegan-friendly plant raw materials. Cinnamon is obtained from the Cinnamon Bark from an evergreen tree growing in Asia and South America. This popular spice contains numerous biologically active compounds, including flavonoids, terpenoids, glycosides, proanthocyanidins and cinnamaldehyde. They give the cinnamon its anti-inflammatory, antidiabetic, antibacterial and antioxidative properties. The substances present in cinnamon can be divided into: soluble in water and soluble in fats. The first group contains compounds that have positive impact on the body, the second group, substances with the adverse effects. Most supplements contain ground cinnamon bark with ingredients from the two groups, but CinSulin® is composed of aqueous cinnamon extract. Thanks to the patented extraction process, it was possible to obtain pure cinnamon extract (a concentrated source of beneficial water-soluble substance), and to reduce the amount of undesirable compounds. Nowadays people are struggling with the impaired glycaemia. It has negative impact on the body, and may lead to kidneys, eyes or blood vessels dysfunctions, so it is very important to prevent its occurrence. The bioactive components contained in the cinnamon bark fight the factors that affect normal blood glucose levels. The impaired glycaemia usually appears when glucose cannot cross the blood-tissue barrier. This condition is called: insulin resistance, and at the molecular level it is caused by abnormal intracellular communication, which involves series of phosphorylation and dephosphorylation reactions. The PTP-1 enzyme is the protein that most often loses its function in hyperglycaemic states. Its hyperactivity prevents the glucose transfer - it does not enter the cells and remains in blood. The studies have proved that the substances contained in cinnamon can successfully restore the proper enzymatic functions of PTP-1 protein, increase the release of insulin from the pancreatic islets, and limit the absorption of carbohydrates in the gastrointestinal tract, contributing to glycaemic normalisation. Carbohydrate and lipid metabolism problems are closely related to pathology progression in the cardiovascular system. The compounds contained in cinnamon improve the lipid parameters, especially those lowering LDL cholesterol. They also have the ability to activate numerous enzymes that neutralize free radicals, inhibiting oxidation of LDL to oxLDL, and preventing atherosclerosis. Cinnamon supplementation may also reduce the risk of thromboembolism. Cinnamonophylline contained in cinnamon inhibits the production of thromboxane A2, one of the factors that cause aggregation. In addition, coumarin derivatives prevent blood coagulation, effectively reducing the risk of heart attack or stroke. It is also worth mentioning that cinnamaldehyde, one of the main components of this supplement, significantly reduces the systolic blood pressure. It is particularly important for people who are struggling with resistant hypertension. Cinnamon is one of the most beneficial spices on earth. It is used as an antiseptic and is effective in cases of ear, lung and gastrointestinal infections caused by fungus Aspergillus niger and Candida albicans or by strains of Salmonella typhimurium and Escherichia coli. For the right functioning the nervous tissue needs large amounts of energy and oxygen. Unfortunately, the oxygen metabolism is connected with the production of free radicals that may damage the neuronal structures. It has been demonstrated that the polyphenols contained in the cinnamon extract, apart from their antioxidant activity, regulate the functions of proteins from Bcl-2 and SIRT group and protect nerve cells. Nowadays more and more people are struggling with obesity. The process of reducing body fat is quite monotonous, however, thanks to the new knowledge and technological developments there is a possibility of pharmacological support. Some of the studies indicate that substances contained in cinnamon improve the process of lipolysis and lower the amount of fat cells. 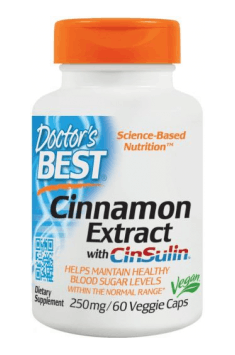 Summing up, Doctor's Best Cinnamon Extract + CinSulin is a high-quality supplement with health promoting effect. The CinSulin® formula stabilises blood sugar levels and has antioxidant properties, supporting the circulatory system and preventing civilization diseases.